Dr Amy Eccles joined Guy’s and St Thomas’ as a consultant in October 2016. She completed her training as a radionuclide radiologist in 2014. She is currently studying for a Master’s in Clinical Education. As well as being a doctor, Amy is a singer in a local choir and runner. She has completed several half marathons and the London Marathon. 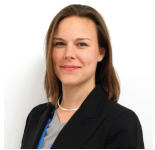 Amy’s areas of interest within nuclear medicine imaging include hybrid SPECT/CT imaging for both oncology and musculoskeletal conditions.